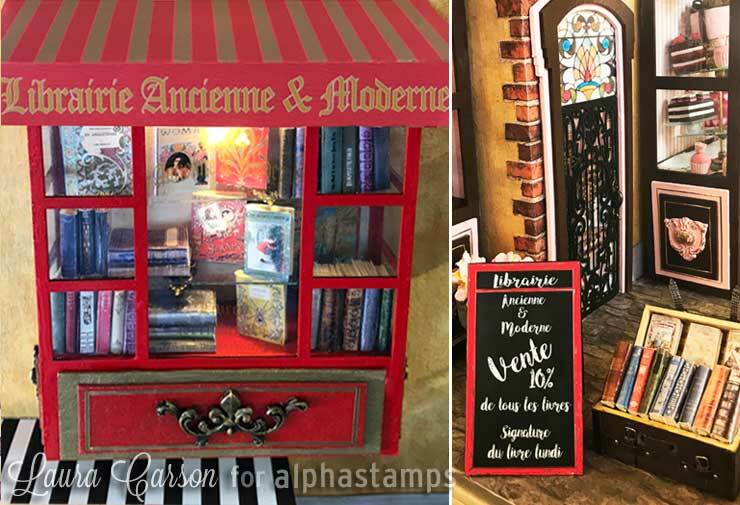 ﻿	Alpha Stamps News » A French Bookshop AND a Witch in the Woods! A French Bookshop AND a Witch in the Woods! Wow! Can you believe we’re at “episode” NINE of Design Team Member Laura Carson’s The Streets of Paris series? Note: You can easily look back at the previous posts in this series; the last one was the upstairs Maison de la Mode — The House of Fashion, shown at left. The new products and techniques shown today can be used on all sort of projects (whether building a bookstore display window or not)! As Laura’s block of fancy shops is already getting pretty full, she created the appearance of a bookstore upstairs (above the cafe) but it’s really only an exterior window and a hanging sign (plus a sandwich board advertising the shop — and a case of books — on the sidewalk below). Laura created 2 new collage sheets today (one with awnings and signage for this bookshop, and the other for the witchy project shown below). See everything Laura used in her supply list. Come back after enjoying her new video tutorial (and lots more info & photos) for new items, and a Giveaway drawn from Laura’s other new project! Hooray for the Witch in the Woods Giveaway! This would make a great addition to Grimsley Village or as a standalone project. In the woods, the witch has set up shop and in the center is a bubbling cauldron filled with ick green boiling goo. To go along with this project I have a new collage sheet plus a video tutorial where I walk you through how I constructed the witchy scene. I love how Laura used paper clay and silicone molds to make 3D bats to add details to the cauldron. And today’s Giveaway is: EVERYTHING in Laura’s Witch in the Woods supply list! Note: both the Forsaken Cemetery Collage Sheet and Forsaken Cemetery Set Download are listed in the supply list… the winner will get to choose which of those options they’d like to receive. 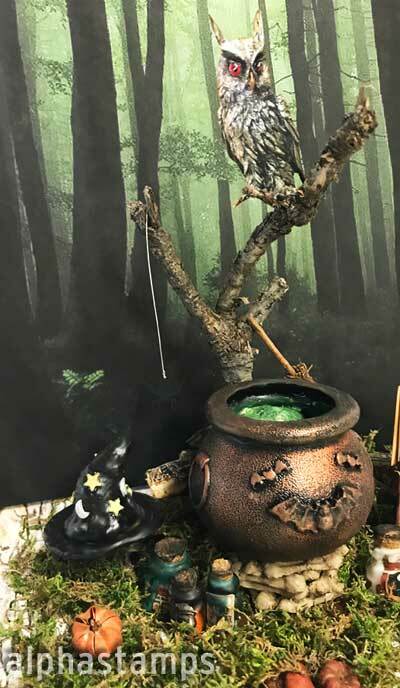 To enter the Witch in the Woods Giveaway drawing all you have to do is leave a comment BELOW on this blog post TODAY or TOMORROW (the deadline is 11:59 pm PST, Friday Night, August 31, 2018). Hey, who won the Nature Study Giveaway from Sunday’s newsletter? That would be Carol Feiner! Congrats! Check your email for info. Psst: a note for recent winners. Now don’t fret! Between the transition to the new site software (and running 2 sites concurrently) the Giveaway packages have been a bit delayed, but they are still coming! Love, love, love both projects! August 30th, 2018 at 8:01 am. So very creative! My sister has a tiny cottage in the woods and the basement is filled with books! I could combine these two! August 30th, 2018 at 8:05 am. Happy to see Halloween things highlighted! August 30th, 2018 at 8:07 am. August 30th, 2018 at 8:09 am. Just love all the Haloweeny items. Poe and Hitchcock were always my favorites! August 30th, 2018 at 8:14 am. Laura’s creativity is over the moon! Awesome! Love the Witch in the Woods! August 30th, 2018 at 8:17 am. August 30th, 2018 at 8:18 am. Wow! LOVE the Witch in the Woods (love everything on here)! So much detail it’s Spooktacular. Thank you for offering such an awesome Giveaway. August 30th, 2018 at 8:21 am. Both of these are really good. I cannot pick just one. August 30th, 2018 at 8:24 am. Looking forward to seeing what other scenes Laura adds to Grimsley Village this year. August 30th, 2018 at 8:28 am. I love everything witchy! I really want to try the molds. This is a fantastic giveaway! August 30th, 2018 at 8:38 am. Halloween is the most fun holiday to craft for! I love both the Witch in the Woods and the wonderful French Bookshop. So creative and detailed. Love these projects! Halloween is my favorite holiday and I would love to make the Witch in the Woods scene! August 30th, 2018 at 8:47 am. I LOVE this little witch cauldron! 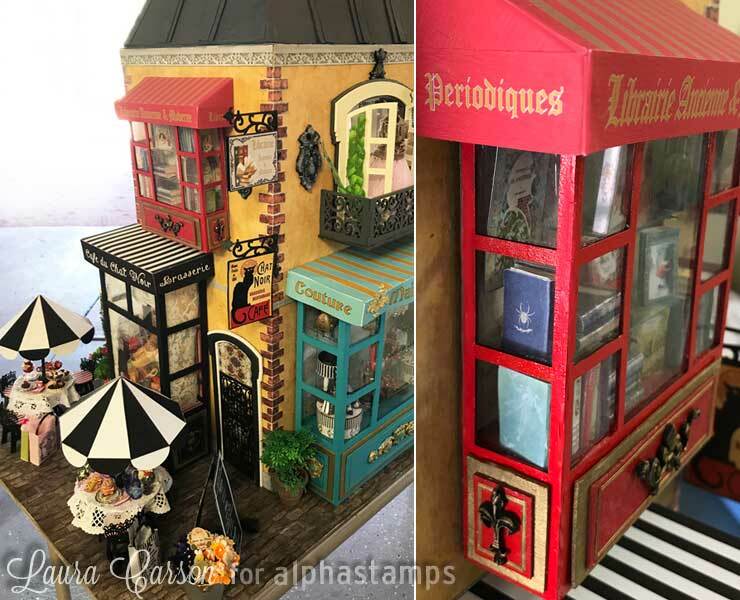 So cute – i would love to make this for my miniature house! August 30th, 2018 at 8:56 am. I love it. It would make a perfect addition to the witchy workroom diorama I’m working on. August 30th, 2018 at 8:58 am. I love to decorate for Halloween.. The give away is great! August 30th, 2018 at 9:01 am. The detail on both of these is amazing. Love love love! August 30th, 2018 at 9:04 am. Great items and fun stuff! August 30th, 2018 at 9:09 am. August 30th, 2018 at 9:17 am. I just love that French bookstore. The Witch in the Woods is cool too. I would certainly try my best with it! August 30th, 2018 at 9:19 am. WOW!!! Don’t know where to start. Both kits are fabulous. Best you have had in several months. Could do so much with all of it. Just make me the winner and I’ll send pictures of finished wonders. PeginOKC. August 30th, 2018 at 9:22 am. Halloween is just made for miniatures. Or should that be the other way around? August 30th, 2018 at 9:39 am. Love the miniature Halloween scenes,these are really great! August 30th, 2018 at 9:44 am. Oh how I love all the witchy goodness! August 30th, 2018 at 9:48 am. Love the, both! Can’t believe the creativity I see here every week! Laura’s work is amazing! Thanks for another great give-away! August 30th, 2018 at 9:56 am. Laura is very creative and talented. I watched her video on how she created her witch in the woods. I love how she made her cauldron. I would love to win to create my own miniature Halloween scene using her techniques. August 30th, 2018 at 9:58 am. August 30th, 2018 at 10:02 am. August 30th, 2018 at 10:14 am. I love the witch I the woods especially the cauldron! August 30th, 2018 at 10:23 am. Love, love, love the Witch in the Woods. So creative. August 30th, 2018 at 10:45 am. August 30th, 2018 at 11:04 am. It is the bestest time of the crafting year! Both of these are amazing. I love all the details and versatility. August 30th, 2018 at 11:14 am. This makes me 1. Want to go to Paris and 2. Want fall to hurry up and get here! I love these! August 30th, 2018 at 11:33 am. August 30th, 2018 at 12:02 pm. I adore miniature books! So much fun! August 30th, 2018 at 12:10 pm. Another fab project from Laura, the woman who never sleeps!!! August 30th, 2018 at 12:21 pm. Witch in the woods? That would be me. I love this little project. August 30th, 2018 at 12:23 pm. Very cool! I am working on Halloween pumpkin diaroma. .would be fetching inside…. August 30th, 2018 at 12:25 pm. August 30th, 2018 at 1:13 pm. I really love the finish on the cauldron and the green goo! Halloween crafts are my favorite. August 30th, 2018 at 1:25 pm. Yes, it would make a great addition to Grimsley Village! I definitely need to make this for my village!! Love Laura’s stuff!!! August 30th, 2018 at 1:49 pm. Halloween AND books! I’m in heaven. Even better when both are in projects by Laura Carson. August 30th, 2018 at 2:01 pm. August 30th, 2018 at 2:10 pm. I love this giveaway so much!! August 30th, 2018 at 2:45 pm. Love the Halloween diaroma, witch in the woods, awesome! August 30th, 2018 at 3:08 pm. Love the Halloween diaroma. Book shop is awesome! August 30th, 2018 at 3:11 pm. I’m so happy to see Halloween highlighted. I love the witch in the woods. August 30th, 2018 at 3:17 pm. YIPPEE!! It’s time for Halloween projects. Always love Laura’s creations. August 30th, 2018 at 3:20 pm. Laura is such an amazing artist! My favorites are her Halloween creations though. I would love the chance to recreate her scene. August 30th, 2018 at 3:25 pm. I love Halloween and this is great! August 30th, 2018 at 3:26 pm. August 30th, 2018 at 4:06 pm. Hooray witches and candy are back! 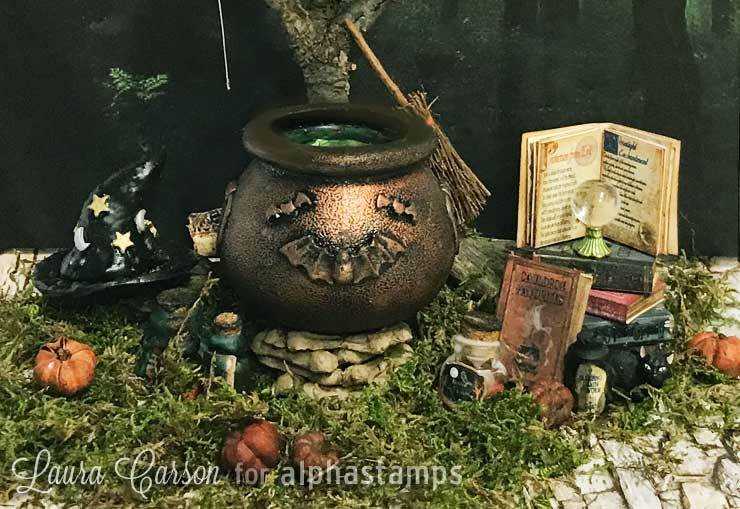 I’ll fill the little caldron with m&m’s and even share with my grand babies while we work on our Halloween scene! August 30th, 2018 at 4:31 pm. Love the new collage sheet used in the Halloween scene! The owl is fabulous & the cauldron is a great large size! August 30th, 2018 at 5:39 pm. Love all of the witchy items- especially the cauldron! August 30th, 2018 at 5:55 pm. August 30th, 2018 at 6:07 pm. I am so excited for Halloween! And witches, yep I’m all in. August 30th, 2018 at 6:16 pm. August 30th, 2018 at 7:16 pm. I like both projects but right now I’m thinking Witch in the Woods. August 30th, 2018 at 7:42 pm. I love both projects created by Laura. She’s just so creative! August 30th, 2018 at 7:48 pm. I think that both projects are great! I would love to do something with the Witch in the Woods theme for Halloween. August 30th, 2018 at 8:53 pm. It’s nearing the witching time of year and I would just love to make either project…what talent! August 30th, 2018 at 9:24 pm. August 30th, 2018 at 10:27 pm. August 30th, 2018 at 11:23 pm. Congrats Carol! Great projects. Thanks for another great give away. August 31st, 2018 at 1:08 am. August 31st, 2018 at 2:00 am. I have two favorite things in miniature. Shabby and Halloween. Needless to save I LOVE THIS! August 31st, 2018 at 6:02 am. Wow, spooooky and cute. I love it! August 31st, 2018 at 6:52 am. Stunning!! Halloween is my most favorite ever ! This is an amazing project-very well done. August 31st, 2018 at 11:00 am. August 31st, 2018 at 11:05 am. You are driving me batty with all of Laura’s amazing Streets of Paris shops! Then you throw in a cool Halloween treat as the icing on the cake! Loving all of her awesome projects and can’t wait to see even more! TFS! August 31st, 2018 at 12:21 pm. Love all things French themed and all things Halloween! These projects are wonderful! ! August 31st, 2018 at 3:36 pm. Love the Witch in the Woods. So much fun to recreate. August 31st, 2018 at 6:38 pm. I LOVE, Halloween, pumpkins, bats, cats and witches…am I evil ? August 31st, 2018 at 7:49 pm. August 31st, 2018 at 11:48 pm.